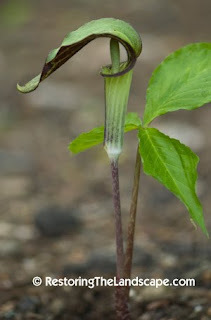 Jack in the Pulpit (Arisaema triphyllum) was one of the few woodland natives that was present in our yard before we started our yard restoration. 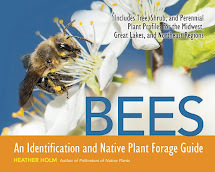 One reason is that they are not browsed by deer or rabbits and readily propagate from seed. 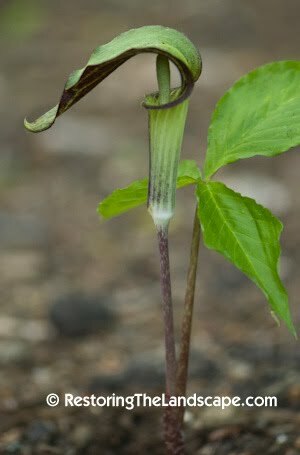 We have had very good success in adding more Jack in the Pulpits to our yard by collecting the seeds when the outer pulp turns red. 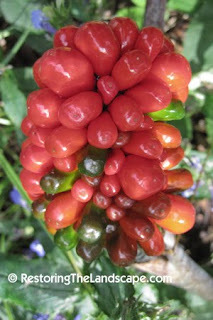 Inside each of the red fleshy pulp capsules are several seeds. According to William Cullina in his book Growing and Propagating Wildflowers, the pulp needs to be washed off because it contains germination inhibitors. 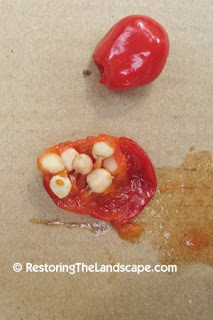 It also has a skin irritant so wearing gloves is recommended when removing the pulp. 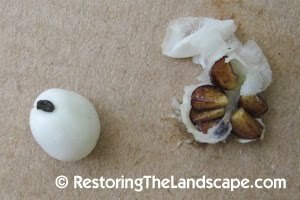 After we clean the seed, we plant it throughout the yard in 3 inch deep holes (a couple of seeds per hole). I will plant these in a triangular pattern or 3 holes about 1 foot apart. This makes it easier to identify the first leaves emerging the following year which don't look anything like the true leaves. I then know not to weed these out when I see the triangular pattern. We have several seedlings of various ages now in our yard after planting seeds for the last 3 years. 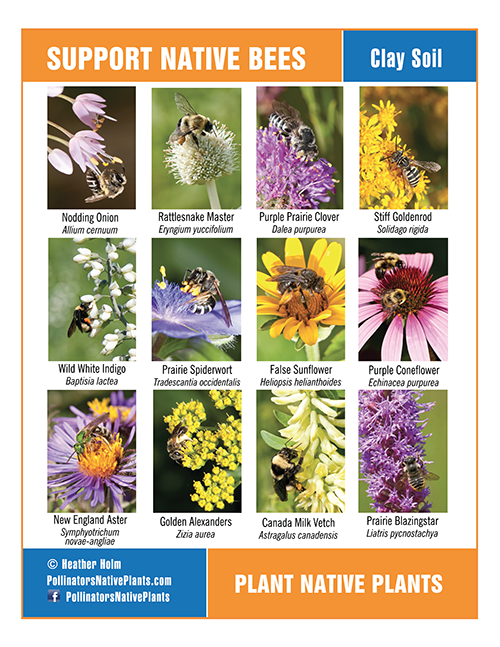 The older ones should start flowering soon. 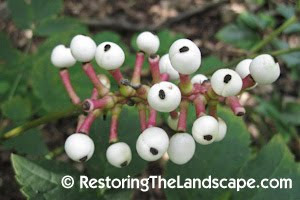 The other woodland native that has ripening white seeds that look like berries is the White Baneberry (Actaea pachypoda). A related species also native to our area is the Red Baneberry (Actaea rubra) but its red seeds ripen a little earlier than the White Baneberry. This is another easy native to grow from seed. Like the Jack in the Pulpit, the fleshy pulp also needs to be removed. 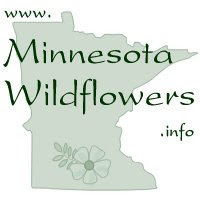 It is also important to sow these seeds right away so they don't dry out (William Cullina, Growing and Propagating Wildflowers). My success rate with these has been really high. They are easier to recognize the following spring too because they form their true leaves in the first season.